Backed by over 150 years of innovation, Armstrong World Industries Ltd is a global leader in supplying ceiling and wall solutions in market segments such as Office, Education, Health, Retail, Transport and Hospitality. Armstrong remains a foremost name in the building industry, known and trusted for reliable quality & technological innovations. 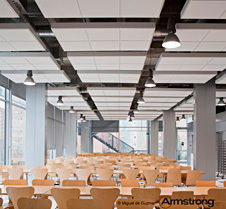 Armstrong’s offers a peerless portfolio of materials (mineral, metal, wood, resin and fabric) and systems (including TECH ZONE which guarantees the integration of services such as lighting, air handling, loudspeakers and chilled beams). End Of Life (EOL) Recycling Scheme. Armstrong offers a free collection programme for refurbishment / strip out projects of 2000m2+, anywhere in the UK. The ceiling tiles are 100% recycled into the mix and are processed into new ceiling tiles. Off Cut Recycling Scheme (OCR). Off-cut ceiling tiles from new ceiling installations are stored on site in specially supplied bags and collected by Armstrong to be recycled into new ceiling tiles. Armstrong Atelier is a portfolio of solutions designed to take the relationship between architect/designer and building interior solutions provider to unprecedented levels. Armstrong Atelier comprises a specially recruited team of multi-talented, versatile experts comprising CAD designers, project managers and technical sales representatives and a portfolio of intelligent, efficient, cost-effective tailored ceiling and wall solutions for even the most challenging of creative and technical briefs. Armstrong Atelier can be previewed on the new dedicated website www.armstrong-atelier.eu.